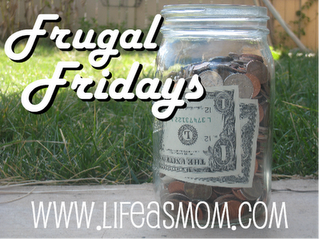 I am going to try to be consistent about the Frugal Fridays tips hosted by Life as a Mom. With five kids, who see to always be starving, I am always on the lookout for inexpensive ways to fill them up. And healthy too. My breakfast of choice is often a bowl of oatmeal. Oatmeal is relatively quick to make, and it is inexpensive. The reason for this post is that I had no choice but to shop a store last week that tends to have higher prices than my usual store (but some great sales!) and I really needed oatmeal. I just about collapsed in the cereal aisle to see the store brand container of Old Fashioned Oats was $4 (Quaker was even more). I quickly did the math, and realized that driving to my regular store would eat up the $2 difference in gas, plus I really did not have the time to be going. So, I sucked it up and paid it, determined to analyze that purchase and be sure it was still a good deal. So, on an oatmeal morning, life looks something like this... I put the teakettle on, and measure oatmeal into bowls lined up on the counter. We use 3 cups of oatmeal in total. I add something to the oatmeal (homemade cinnamon sugar, a spoonful of peanut butter, raisins, molasses, a bit of pancake syrup, homemade jam, applesauce, chopped apple, vanilla extract, powdered milk, protein powder... whatever jumps out at me on a given day) and by the time I'm done, the tea kettle is whistling. I add hot water to each individual bowl, stir, and call over the kids. They grab their bowls, sit down to pray, and by the time that is done, the oatmeal is perfect. So, according to the container, there are about 30 1/2 cup servings in there. That's 15 cups, or 5 breakfasts using 3 cups of oatmeal. That works out to $.80 worth of oatmeal for breakfast. Even if I'm using $.20 of added stuff (I doubt it, most days anyway), that still a buck for breakfast. For all five of my kids. And that's with the expensive stuff. My usual price for the same size container is just under $2, which means somewhere around $.60 to feel them all, or just over a dime apiece. And, my kids are full. I do try to vary things quite a bit, so it isn't exactly the same thing every day. When peanut butter is cheap, a tablespoon of it is great. For a bonus treat, on the very rare occasion that we have them in the house, I'll add 4-5 chocolate chips. It's not quite a Reese's Peanut Butter Cup, but the kids love it. Oh, and lest I forget... oatmeal is good for you. Not that I know all the ins and outs, but insoluble fiber, lots of great nutrients like vitamin E, zinc, selenium and on and on, reduces LDL cholesterol without reducing HDL cholesterol (I had to look that up, I can never remember which is which), may reduce heart disease and high blood pressure, and lots of other great stuff too. So, pull out that container of oats, and have a healthy and inexpensive breakfast. Go check Frugal Fridays for other great tips... today's main one is about moving in a frugal way, and I saw some great-looking ones on Halloween, movies, date nights, and many, many more.